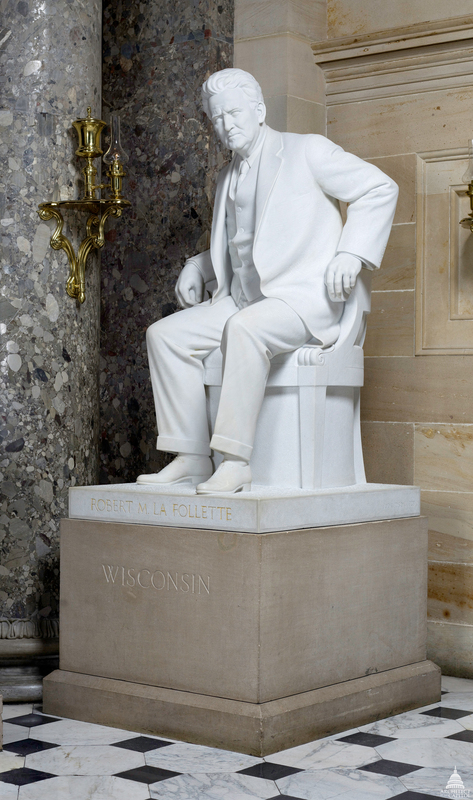 This statue of Robert M. La Follette was given to the National Statuary Hall Collection by Wisconsin in 1929. Robert M. La Follette was born in Primrose, Wisconsin, on June 14, 1855. He graduated from the University of Wisconsin in 1879, was admitted to the bar in 1880, was appointed district attorney of Dane County from 1880 to 1884, and served from 1885 to 1891 in the U.S. House of Representatives, where he supported the McKinley Tariff Bill. Losing re-election, La Follette returned to his law practice and concentrated on improving the political system in Wisconsin. Elected governor in 1900, he proposed and implemented his "Wisconsin Idea." This became an important element of the Progressive Movement; it included opposition to political bosses, employment of technical experts for public service, direct primary nomination, railroad regulation, and tax reform. He nominated himself to the United States Senate for the term beginning in March 1905 and was confirmed by the state senate, but he decided to remain as governor and left Wisconsin's U.S. Senate seat empty until 1906. He then took his seat in the Senate, where he served until his death. On the national level, La Follette worked for progressive reforms, including the direct election of senators. He championed the conservation movement and led the opposition to the Payne-Aldrich Tariff. In 1912 he lost the Progressive Party presidential nomination to Theodore Roosevelt. To make his progressive ideas better known he founded La Follette's Weekly Magazine in 1909 and the National Progressive Republican League in 1911. He opposed American involvement in World War I and President Wilson's foreign policy. He wrote the resolution authorizing the Senate investigation of the Teapot Dome scandal. In 1924, he ran unsuccessfully for president on the Progressive Party ticket. He died on June 18, 1925, in Washington, D.C.